Art making is a universal activity that we can do for novelty, exploration, relaxation, and creative expression. It can also be used as a method of psychotherapy where the art activity forms part of a treatment session. Art as therapy has benefits that are purely driven by the act of creative expression while engaging in a relaxing activity. This is similar to watching a movie, taking a walk or reading a book. The act itself is therapeutic in that it transports us away from our daily stresses. During the activity, we may inadvertently experience emotional expression, understanding of ourselves, and moments of personal insight into problems, however, these outcomes are usually an unexpected by-product of the activity. In many cases, although, we experience these outcomes, we don’t know what to do with them once they surface. This is a general overview of how art therapy differs from art as therapy, however, for a more in-depth understanding, you can read our blog post What Happens in an Art Therapy Session. There are many differences between art as therapy and art therapy, however, the crucial difference is the therapist who is able to develop a therapeutic alliance with the client. Art Therapists generally have a preferred orientation of psychology theory that provides a reference point on how an art therapy session will evolve. Art therapists work with clients to establish what the client needs help with and make a commitment to help facilitate that process with the client. This book involves exploring a series of art works as tools for the resolution of difficult issues in life. A website Art As Therapy has been created which provides insight into art through the themes of love, self, work, politics, anxiety, and free time. These functions of art as therapy help explore the broader foundations of the human experience throughout life. Art therapy through the aid of an art therapist helps us to explore each of these individual functions on a deeper level, particular when dysfunction occurs. SIGN UP below to download the FREE Psychotherapy Skills Handout as a guide for the psychotherapy skills to use in Art Therapy. 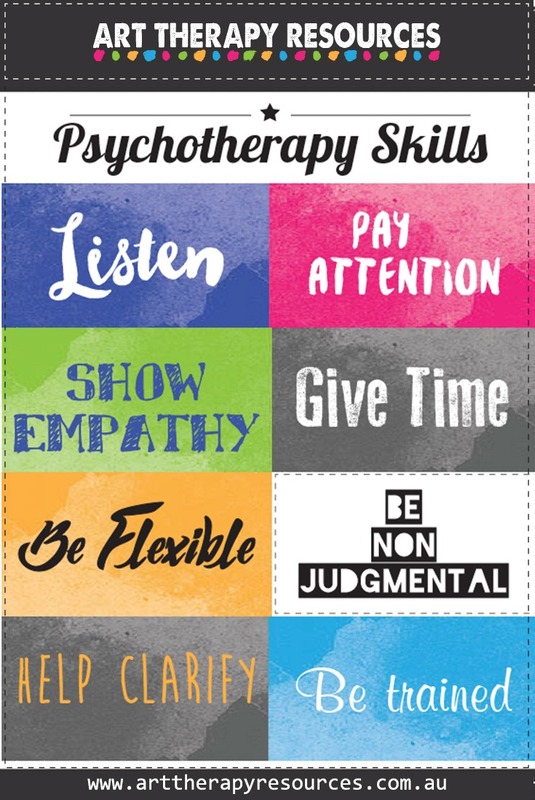 Download the FREE Psychotherapy Skills Handout.